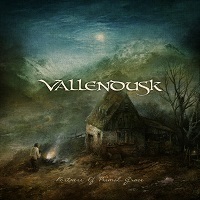 Hailing from Jakarta, Indonesia, comes the Atmospheric Black Metal band VALLENDUSK. The band formed in 2011, and present their third full-length album here titled “Fortress of Primal Grace,” which contains seven new tracks. “The Presences” is an eleven minute opus, and opens with acoustic guitar, and that old school organ sound high in vibrato. At first, the meter is in 3/4, and then shifts to 4/4 and back, and the blackened vocals are in the mid-range for the most part. The music is loose enough to not be within that traditional “wall” that we often here in the genre, and it’s a nice change of pace for me. Fanciful instrumental interludes can be heard as well, building that atmosphere that is so pretty in this genre. “In Reverie” is considerably shorter. Snippets of a regal sound that could be heard in the opening track are on more prominent display here, reminding me at times of INSOMNIUM in that regard. The bass guitar work here is stellar and can be clearly heard, as well as the whirlwind of tight percussion by Derick Prawira, and the stalwart lead guitar breaks. “Coronation” opens with a galloping rhythm and swift pace, and with a full embrace of folky melodies that contrast with the intense Black Metal vocals in a grand fashion. In a surprising twist, we have clean vocals as well, done in the manner of an old fable or legend that might be sung to children around the night’s fire; a tradition of sorts. “At the Heart of the Storm” is a little shorter, at just under seven minutes. The steady thud of kick drum fuels a hearty sound that is strong with guitar presence, and both an angry swoon and a charming set of melodies and harmonies along the way. “Eons” has with a jovial sound that in many ways seems to reflect the vibrance of forest life, as rays of sun peek through the canopy and warm the ground, and chirping birds and scurrying animals carry about their normal daily life. When you consider the beautiful nature of the music working with the blackened vocals, it is actually quite striking. “The Shield” closes the album, in a culmination of sorts that has elements of many of the previous songs throughout. They dial up the aggressiveness and the melody at the same time, the two opponents locked in mortal battle that might threaten to upset the cosmos and send fireballs to destroy the planet. Overall, a thoroughly enjoyable album with a unique twist on the Black Metal genre. Some of the longstanding traditional sounds are here, but “Fortress of Primal Grace” blazes its own trail into the dark night, using some folk sounds, building columns of melody, and majestic interludes that awaken your sense of enchantment.